The Arch of Constantine in Rome, is situated next to the Colosseum in the Piazza del Colosseo, close to the bottom of the Sacra Via which leads to the Arch of Titus and the Roman Forum. It was erected in AD 315 by the Senate to commemorate the victory of Constantine over Maxentius at the Milvian Bridge in AD 312. 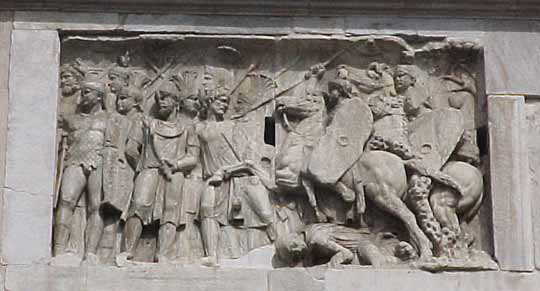 The battle of the Milvian Bridge was the decisive moment in Constantine's ambitions to consolidate his power. In Britain, after the death of his father, he had been proclaimed Augustus by his troops, despite having no legal claim to the title. Maxentius also laid claim to the title of "Augustus of the Western Empire". This conflict was finally resolved in the battle of Milvian Bridge, located to the north of Rome. Although outnumbered, Constantine's army was victorious. The defeated Maxentius, died while making his escape, after a bridge across the Tiber, constructed from boats, suddenly collapsed. After the Battle of Milvian Bridge, this triple-passageway arch was constructed adjacent to the Colosseum to commemorate the triumph. 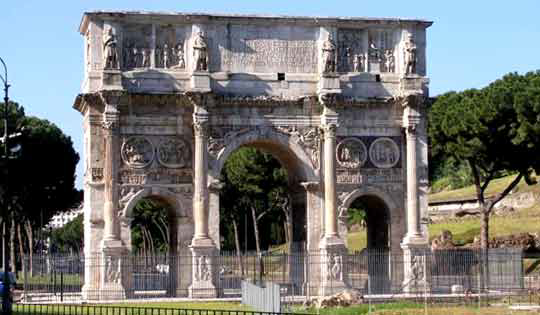 Although the arch was the largest to be erected in Rome for almost a century, its construction becomes less impressive when closely examined, as many of the sculptures had been robbed from earlier monuments. The coulombs, and a number of other architectural features also date from earlier times. The relief's originating from the second century were refashioned to honour Constantine by re-carving the heads of earlier emperors with Constantine's features. The reuse of these has been interpreted by some as an indication of Rome's decline during this period. Over the side arches can be found eight sculptures depicting hunting scenes and sacrifices, these date from the time of Hadrian 117-138. An original portrait of Hadrian has been replaced by images of Constantine and Licinius. Carvings of prisoners on the architraves, two reliefs on the narrow sides of the attic story, and those inside the main arch, date from the time of Trajan 98-117. On the long sides of the attic storey are carved eight reliefs showing scenes of the triumphs of war. These date from the time of Marcus Aurelius 161-180. The second half of the side inscription tells us that the Arch of Constantine was erected after the tenth year of Constantine's reign. The inscription is interpreted as saying that Constantine has reigned for ten years, so may he reign twenty. The title Maximus, in the main inscription, occurs only on coins that were struck after the tenth year of Constantine's reign. The phrase "INSTINCTV · DIVINATATIS · MENTIS" meaning "by divine inspiration" has been interpreted by some as referring to his later policy of promoting Christianity.